We spoke to Brian Brandt, CEO of online marketing company Clickstarter. In this short interview he gives his perspective of the current benefits of data feed marketing and where he sees the industry progressing in the next few years. Could you tell us a bit about yourself and what do you do at Clickstarter? My name is Brian Brandt, I’m the CEO of ClickStarter.dk, a dedicated online marketing bureau, where we work very closely with our clients to ensure growth and positive numbers on the bottom line. Speaking broadly, Clickstarter work in online marketing, selecting the marketing funnels that gives our clients the best growth for the least effort. We work both with small, innovative entrepreneurs as well as large international companies like Bravo Tours and SkiTravelGroup. When was the first time that you came across Data Feed Marketing solutions? I’ve been using Data Feed Marketing solutions for many years – from back when Google Adwords opened their API, so we could automate actions and later when feeds for Google Shopping opened. What do you think is the major benefit of using Data Feed Marketing solutions? Even though most CMS providers tell they have a Google Shopping Feed or Facebook Feed, it is usually never optimized. Even worse, as a consultant / external developer, it is often impossible to optimize the feed from within the CMS. That is where I see the major benefit from a Data Marketing Solution. What other applications do you see in the future for Data Feed Marketing in the next few years? It would be great to see Data Feed Marketing integrated even more with the CMS platform – then we could improve the data feed with information like the bestselling products, the products with best profit and such. And perhaps integrate with newsletter systems, so it automatically shows products in an automated weekly email. 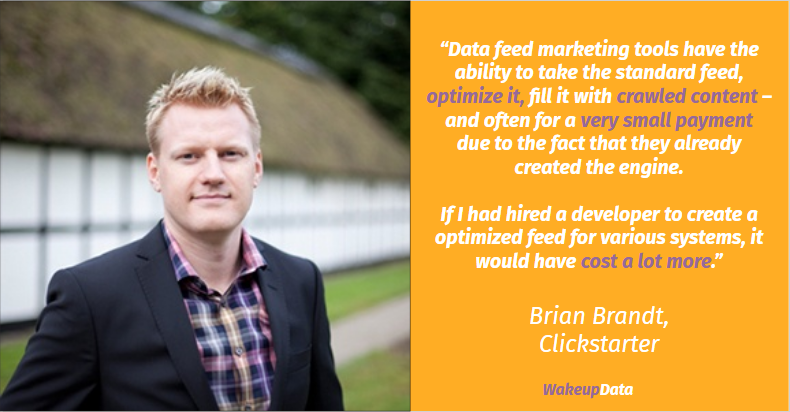 If you have any questions or would like to hear more about Clickstarter or WakeupData's tailor-made product feed optimization solutions please don't hesitate to get in touch!